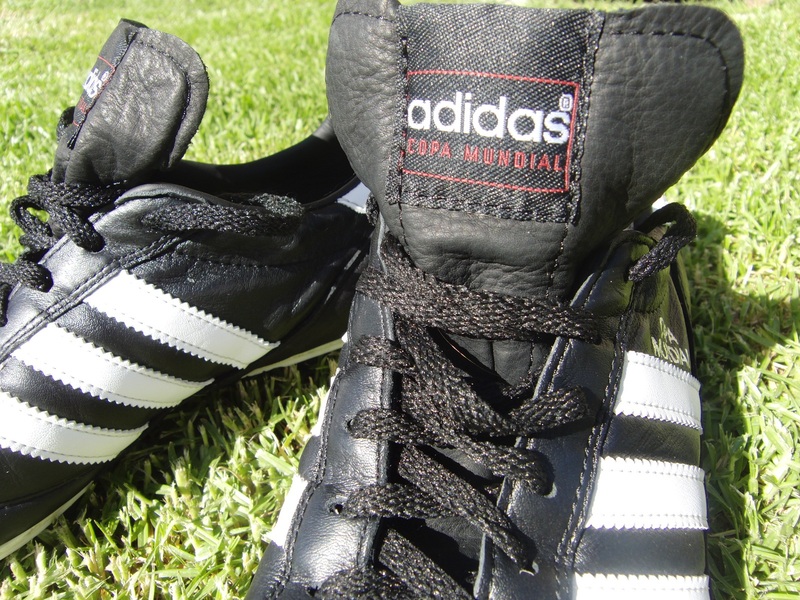 I’m not sure what it is, but there is just something about the Adidas Copa Mundial! Somehow, they have managed to survive the release of several generations of soccer cleats and they continue to be one of the top selling boots on the market. What is even more impressive is the fact that they really have not been updated since their initial release in 1979. For a long time now man of you have been requesting this review, so I decided to bite the bullet and put them through their paces. Currently, I play alongside several players who wear Copas, so I have the added bonus of picking their brains for feedback while putting together this post. For testing, I wore a size 9US. If you are interested in a pair, they are currently available at soccer.com. 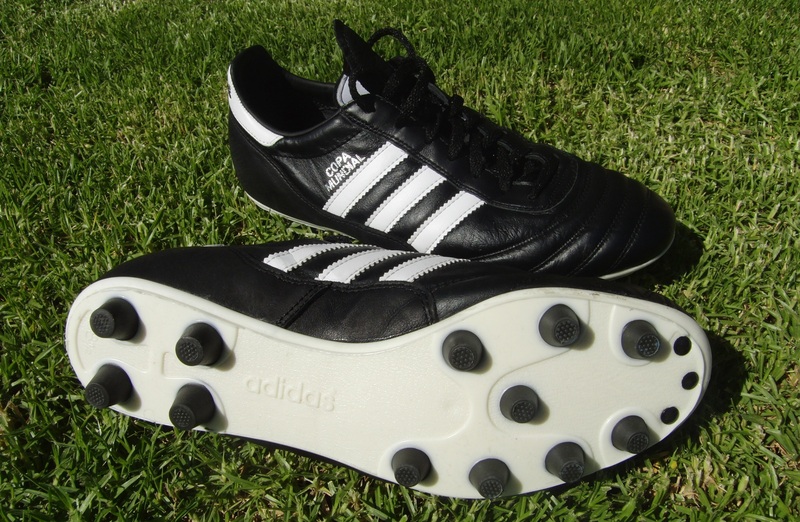 There is no doubt that Copas have withstood the test of time. They were released in 1979, but took the spotlight for the first time at the 1982 World Cup in Spain. After 31 years on the market, they are one of the most purchased boots of all time while continuing to sell in high volume. How do you wear the tongue? One of the most commonly asked questions about the Copa is “How do you wear the tongue?” The tongue on the Copa is very unique. It is longer than a regular tongue and can be worn in many different ways. Some people like to cut it off where it meets the ankle. Others like to leave it loose, so it sits along the font of the shin. Another way is to tuck it under the cuff of the boot, just above the lace. My preference is to fold it across the top of the boot and use the laces to tie it down. There is no set way to wear it and everyone has their own desired style – either way they look good! To be honest, the Copa almost feels like a boot that has been broken in before you wear them. It only took one training session for them to feel super comfortable on my feet. In saying that, because of the exceptional leather used, you are going to need a few weeks before they truly mold to your feet. In total, I wore them in one training session and then straight into 3-4 games. Throughout testing they always felt comfortable and well supported on the field. What I find extraordinary is how the soleplate is so basic compared to many of the boots that are currently released on the market – yet they break in so easily! The Copa is made of a super soft kangaroo leather that just oozes class. I think this is one of the main reasons they have continued to be super popular among players new and old. A lot of brands have drifted towards calf leather or synthetic materials, but the quality of K-leather far exceeds either, especially when it comes to durability. Fact of the matter is players know what they are getting and what can be expected when they order a pair of Copas. Sizing is one of the more important aspects of the boot. I found that I really needed a half size smaller for a perfect fit. I wore a size 9US for testing, but ideally a size 8.5US would have been more suitable. After talking to some fellow players, the consensus seems to be that they fit longer than regular boots. Some players actually went went a full size smaller. If you have a chance to try them on before buying I recommend doing so, but if you are ordering online my general recommendation would be to order down a half size. 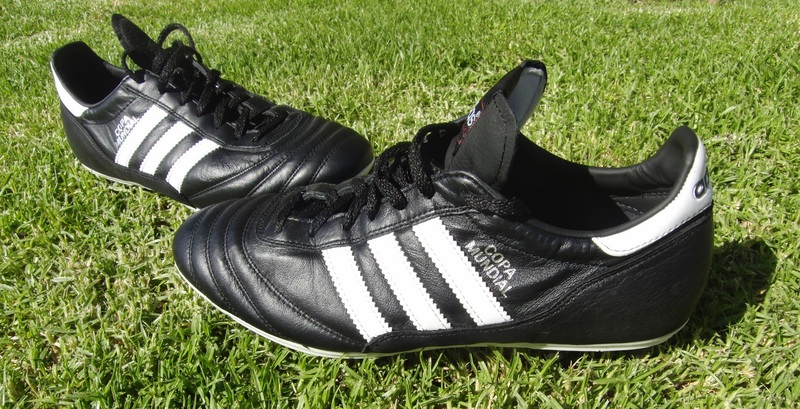 Because they were designed and released in 1979, there is not a whole lot of technology that went into the Copas. But what it lacks in technology, it makes up for in quality. The 100% Kangaroo leather upper gives the boot a great feel and last that every type of player can make the most of on the field. One look at the soleplate and you can tell how basic the whole boot is, it has remain basically unchanged since the very first installment was released. I found the laces to be a little tacky. They are the old school thick laces that you would find on a pair of workman’s boots. Lets be honest, this is a slight negative and can easily be removed by changing the laces out. Although the Copa is a boot built on heritage, I personally prefer the Adidas adiPure. The adiPure is an updated version of the Copa and for me it just offers a little more in terms of looks and all around performance. There are no major negatives about the Copa itself – it is a basic boot that offers quality built around 30 years of player testimonials. What really amazes me about the Copa is how it has managed to stay around for so long. With companies investing millions of dollars a year into developing new boots, Adidas must feel amazingly lucky to have a boot that was designed over 30 years ago selling so well on the market. It means that year in year out they have a boot that they just reap the reward of sales from. It seems to be the 30-40 year old generation that are currently the largest consumers of the soccer cleats, but they also have a strong cult following with younger and older players. If you need a boot that just flat out works – with hundreds of thousands of player testimonials to go along with it – then Copa’s are a great option. They won’t give you the added benefit of super speed or an extra powerful shot (does any boot?) but they will give you quality for what you are buying. I'm with you, Bryan. 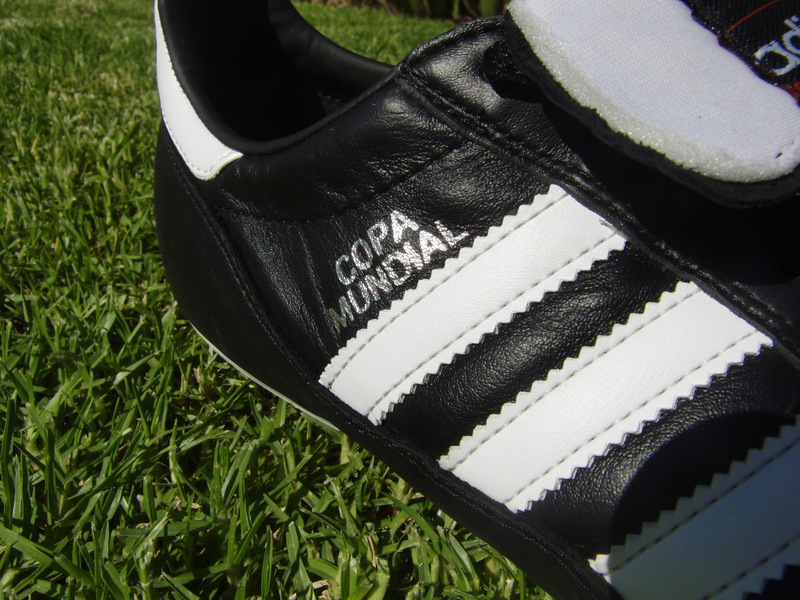 I appreciate the Copa Mundials for what they are and recommend them to others. But I'd rather wear an updated heritage boot, especially with the upgrades the companies can add to their boots without being completely removed from the whole point of the simple K-leather boot (e.g. lighter materials, better insoles, etc.). Plus they don't look so "old" and plain like the Copa. It's the reason why I wear Umbro Speciali Statements now – it's the perfect combination of the old with the new for the same price. Keep up the good work, and I look forward to your next reviews! How can you mention that Umbro in the same breath as the Copa Mundial? Akin to Blasphemy. The Copa Mundial is a Legend. Masterful Touch. Made in Germany. Better Leather, better design. The Umbro Speciali Statement is Made in China, unstable studs, and Bad Durability. Copas usually last over 3 years. And like a fine wine, becomes better with age. Umbro even discontinued that Speciali Statement model after one year. They updated it into something that is "better." Please, the Copa has not changed in 20+ years. It has remained a pillar in the world of football boots since 1982. Umbro Speciali “Made in Italy” is another story though, absoloute class boots as good as if not better than the Copa….now the Made in Japan Mizuno Morelia is on a whole new level. only negatives I can personally say that's not mentioned is in the wet they're noticeably a lot worse than other boots I've worn, maybe for the studs. great review. I wear a 9US and feel comfortable with them though im not sure what half a size down would feel. I still kinda feel more comfortable (esp just pushing the ball away with the outside of my foot) with these than say adizeros but then again I’ve worn the copas a lot longer. I bought 6foot long laces and think they’re perfect to wrap around once under the boot and then to double knot at the top, over the tongue. Def recommend these if they’re a first boot and you got $100 to spend! Bryan, I have a general question and not sure where to ask it… Which soccer cleats provide the best ankle support in your opinion? I rolled my ankle recently and looking for a shoe that will provide the best stability and support. I'm not sure if there are cleats that can do that, may be others can comment on that…but what I have found best to stabilize my ankles after my sprain, is athletic/ sports tape. You can get 3 rolls of Johnson and Johnson for around $10. I used to feel ankle pain when shooting or after an intense game, but it has been about 4 months since I felt any ankle pain. Also, make sure to properly stretch before a game, I can't emphasize enough how important that is (there are lots of great youtube videos on that subject). one of the reason i start o get injuries in my ankle is because i gained some weight and lost some strength in my foot. i was so p1SS off because of having to rest after twisting my ankle so often. then i started to run 5 km every day for two months time, i became lighter,with stronger foot and have not twisted my ankle since. great review. how does the leather in this compare to the one in adipure or nike tiempo? Your best bet is to get an ankle brace to provide support. There really isn't a good option cleat wise, the Under Armour Create is probably the only boot that offers slightly higher ankle support. Leather is very similar – for some reason I felt like the leather on the Copa might be slightly softer, but I have nothing to back this up! First of all thanks for this HP; i really like it. But i have a question, could you please put the new cleats reviews in the review scores? For exmaple the Copa Mundial has a score but he isn’t in the score list. im a big copa fan!!! been wearing for the past 10 years but im willing to try the puma king…my copa size is 8.5. which size i should get?….. They have a similar fit, I would say maybe consider ordering a half size larger with the Puma Kings. but, if the Copa’a are working for you they might be worth sticking to! Really good review, I had a question though. Which are wider, the AdiPures or the Copas? I found the adiPURE’s fit a little wider than the Copa’s. Both have about a medium fit overall. Hello Bryan, I have two questions. I currently wear copas and adiPUREs, sz 10 in copas and adiPUREs in 10.5. The copas fit great though they loosen up as the game goes on. When I wear the adiPUREs I sometimes get blisters on my heel, I sometimes feel a sz10.65 would be perfect if it was made. Question is, do you feel going up to a sz11 would too much of a jump specially after they break in? I don't want my feet sliding around in the shoe. Blisters on your heel usually indicate the boot is actually too big. I think this might be your problem as you said sz 10 in copas and adiPUREs in 10.5. It does sound like you need the extra half size – especially if they are currently a little uncomfortable. A full size might not be a good option but a half size would give you that additional room you need. Tim, the Copa's are great for avoiding ankle injury. While they don't offer more (or less) protection to the ankle from impact injury, they don't have a bladed soleplate and as such don't lock into the turf in the manner that some of the modern boots do. Meaning, while you may sacrifice a tad on grip in the wet, you won't go over on yourself when trying to turn as is possible with blades. You see a lot more of these kinds of injuries occurring, because of the prevalence of bladed boots on the market. Oh, and you can't cut the tongue off, sacrilege of a sort. why did you put power under a t90 the predator is king of that hill? Brian do you recommend that i apply dubblin to these after they were wet? or should i let them dry first and then apply? THANKS!!! Def let them air-dry first, then apply some leather food. When I was playing club before highschool our trainer required everyone to wear these and he was right. I would recommend these to anyone starting to play since they're the perfect basic boot to figure out the fit you like, feel for the ball, develop touch and technique. If you're just starting out you should really use these or a version of the Adipures. 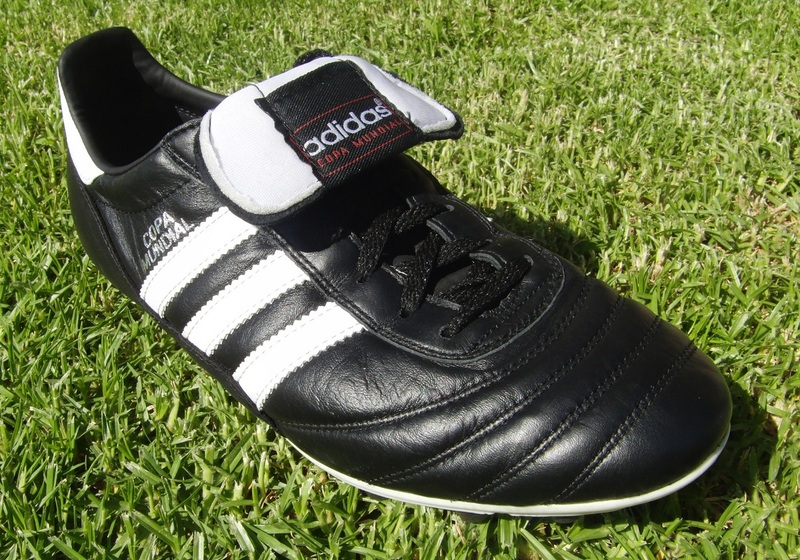 This is the boot that most of us older players used to develop our appreciation for k-leather. The only problem with these is when the upper starts to separate from the lower at the toe and you have to pick out clumps of grass and dirt all the time, but it takes a while for that to happen and Adidas claims it doesn't affect performance. Hi Bryan, I really enjoy reading your reviews. I have been wearing Copa's for many years on on/off basis. These are one of the kind shoes on dry pitch surfaces (firmer type grounds) as the studs are not too long especially on the heal side. When comparing Copas with newer shoes using more tech in them, I have to admit that they are more comfortable (unmatched) but definitely slower shoes. In regard to your preference for AdiPure, I just have to say that AdiPure is a totally different shoe for different type of feets. They are very narrow and not comfy for my type of feet. Thanks! I bought these boots a while ago. I bought half a size down, but the boots which did feel about right size are now feeling to big. What can i do? I won't be allowed to get a new pair of boots untill next season and it may be a while till i grow into them. Thanks! how does this compare to the world cup sg? My last pair of Copas lasted me 15 years. The studs started falling off, but the leather was still in good shape. After buying the preditors or something I wish I had bought another pair of Copas, in fact I think I might still go buy them. 15 years? Lol bro! Who wears boots for 15 years? Should i get Copas or Nike premier 94's. Im not so sure which one ! Get Copa’s, made in Germany (not made in south east asia like most other models). This makes a massive difference. Youtube the video of the production process of these boots and you will see why they are of such high quality. They don’t run 1/2 size small. What you should do is check the EU size chart for any boot and you will see that a US 9 Nike for e.g is = to a US 8.5 in a Copa and most Adidas shoes for that matter. When people bother to read sizing charts there is no confusion and you can’t go wrong. There is a reason why these boots are the number 1 selling boot in the world and Adidas still make them in Germany. agree with u regarding "I found that I really needed a half size smaller for a perfect fit"
For UK size, I suggest 1 size smaller….. I'm a 9.5 regular. Today I went with the size 9 copas mundials over the umbro specialis. I really liked the comfort of the copas. definitely get a half size down. Surely when it rains these will be crap??? Mind you, they were good enough for Beckenbauer!!! Hey Bryan, Hoping this isn't a dead board. I have a question about durability. I usually play in a Wing Back/utility role and I'm looking for a really durable pro boot that's not crazy expensive. How durable are these boots? Can they take a hit and get beat on say 2-3 times a week? I currently have Nitrocharge 2.0s but I'm looking for something that's more all around with a better touch that doesn't sacrifice durability or protection. You should look at boots like the Adidas Gloro or the Nike Premier. Both are modern versions of this boot and would be a better suit if you are switching from the Nitrocharge. plus, price wise they are excellent value!